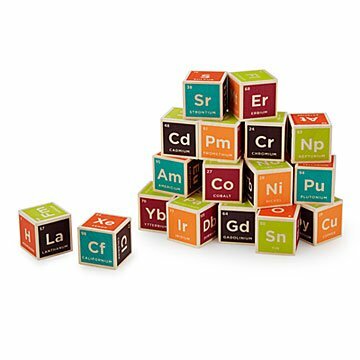 This set of 20 blocks contains every single element from the periodic table for vibrant early learning. Perfect for the young scientist, these cubes are literal building blocks for an education in chemistry. The set includes 20 six-sided colored blocks that contain the 118 elements found on the periodic table. The six sides contain a unique element's name, atomic number and symbol in bright blue, purple, green, red, orange or pink. Handcrafted in Michigan of Basswood grown in the Great Lakes area and printed with non-toxic inks. My friends 2yo son is beginning to read & sounded out every block as he was stacking them. They're science nerds & she greatly enjoyed this gift. She will love these and my friends got a real kick out of the blocks. I appreciate that these are out there and available to us science minded folks. Building blocks help build motor and spatial skills in children but parents will also appreciate the reference to the periodic table! This was a baby shower gift to accompany a children's book about the first 10 elements of the periodic table. I hope these blocks encourage my son to be a scientist! Really nice blocks and so cute! Really high quality wooden blocks. I have ordered from Uncommongoods before and when the order was delayed, their customer service was amazing. Great company! Perfect gift for an expecting science teacher! Durable and well built. The gift was well received!